Shop our newly expanded selection of ECCO products to find the ideal light, alarm, or camera for your application. Del City is proud to be a leading supplier of ECCO lighting and backup products, including beacon lights, mini light bars, and auxiliary lights. 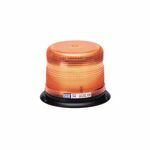 Emergency beacon lights are designed to provide your vehicle with caution lighting to communicate and alert other motorists of your vehicle. Class I, II, III and low-intensity strobe emergency beacon lights are offered with varying profiles and illumination options. Mini ECCO LED light bars are offered in Class I and II styles that offer a compact warning solution to announce your presence to other motorists. ECCO backup alarms and cameras add an additional level of warning and security to your vehicle with an audible warning signal and visibility to your surroundings. Finally, a huge selection of auxiliary ECCO lighting is offered for use on a variety of commercial and personal vehicles. Many of the auxiliary options feature bright ECCO LED lights for the best option in the market. Work lights, directionals, utility bars, safety directors, and warning lights are all offered to equip your vehicle with the necessary auxiliary lights to keep yourself and those around you safe. Find just the right ECCO lighting product today at Del City!